The posh city of Opatija belongs to Primorje-Gorski Kotar County. Once populated by the Liburni Illyrian people, the area has remained a pleasant destination through the ages. In the late 1800s, the area became a most fashionable resort for Eastern Europeans. Drawn by the striking terrain, attractive climate, and beautiful blue water, dukes, barons, and aristocrats from Russia, Scandinavia, and the Habsburg Empire built mansions and vacationed in elaborately detailed, finely furnished resort homes on the water. 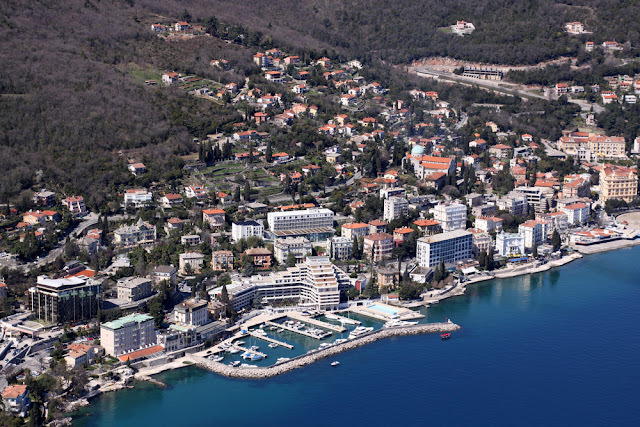 The elegant promenade, Lungomare, and the central beach area, Slatina, are the places to be seen in this elegant retreat. Chic shops, fine dining, and incredible architecture blend together to create a delightful belle époque vision of a more genteel time in this stylish seaside paradise. See ART Google Map for additional recommendations on places to see and things to do in Opatija: http://www.adriaticroadtrip.com/p/adriatic-road-trip.html.